The stakes were high last night at Ed Meagher arena. Not only were the Stingers trying to remain the defending Corey Cup champions, but they were battling for the top spot in the east division of the Ontario University Athletics conference. With a win, they would surpass the McGill Redmen, who sit atop in the east with 32 points. Concordia and Queen’s University were tied for second place with 31 points. Stingers head coach Marc-Andre Element admitted that standings was on his team’s mind. “We had it written on our board [in the locker room],” he said. Unfortunately, the nationally fourth ranked Redmen spoiled the evening for the number nine Stingers after winning the game 2-1 in overtime. “It’s not fun the outcome, but it’s a big point for us,” said Stingers head coach Marc-Andre Element. With the win, McGill maintains their top position in the OUA with 34 points. The Stingers trail by two points and are still tied for second with Queen’s, who also lost 5-4 in overtime to York on Friday night. McGill dominated the first two periods of play. The Redmen found themselves on the powerplay three times for the first 20 minutes. Only a few seconds after the opening whistle, Stingers third-year forward Scott Oke was sent to the penalty box for a two-minute minor for checking a Redmen from behind and a 10-minute major for misconduct. Captain Olivier Hinse joined his teammate a few minutes later. The Redmen had no problem generating some quality chances in the Stingers zone but they successfully killed the penalty. For McGill, however, it did seem like third time was the charm after defenseman Anthony Cortese took a slashing penalty. Redmen forward Christophe Lalonde tipped in a shot from the blueline to give his team a 1-0 lead. “We gotta control our emotions,” said Element, whose team had taken a total of seven penalties in the game. That goal seemed to shake the Stingers’ confidence as they generated little to no offensive chances in a power play at the end of the first period. Concordia was opportunistic early in the second period. Forward Matt Boudreau sent a backhand pass from behind Redmen netminder Jacob-Gervais-Chouinard to Oke, who made up for his indiscipline after chipping the puck top-shelf to tie the game. Aside from that goal, the Stingers defense had a hard time containing McGill’s speed. After the 10-minute mark of the second period, the Redmen exerted heavy puck control in Concordia’s zone for approximately four minutes. Concordia kept icing the puck and Element was forced to call a time-out to give his players a rest. “We let them play, we let them take the momentum,” said captain Olivier Hinse about the first two periods. Luckily for the Stingers, Cadorette was a brick wall after allowing the first goal, stopping 28 of 29 shots directed towards him after 40 minutes of play. The Stingers finally showed their true selves in the third period, outshooting McGill for the first time, 10 shots to seven. Philippe Sanche and Anthony De Luca were up to their usual in the offensive zone but were unable to find the back of the net. While Gervais-Chouinard only faced 23 shots total in the game compared to Cadorette’s 38, the Redmen’s netminder was solid when he had to be. Stingers forward Anthony Beauregard out skated his opponent’s defense to get on a breakaway but was stopped. On the other end of the ice, Cadorette made an impossible save. 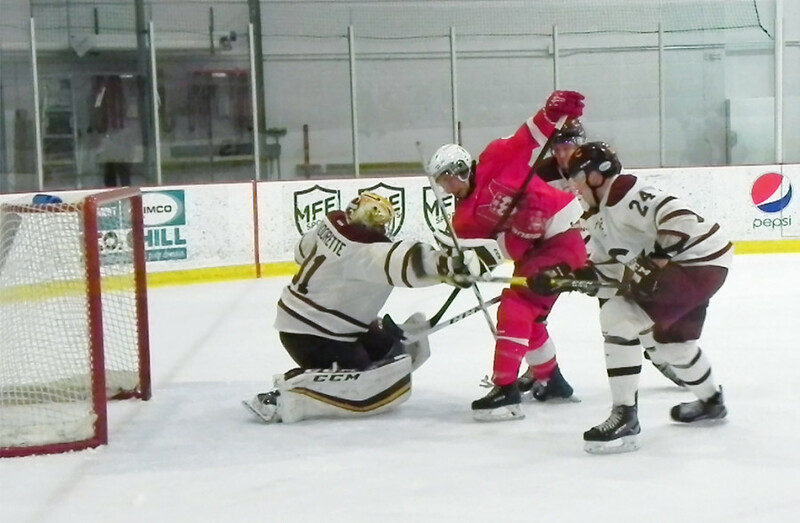 A McGill forward had a wide-open net but the goaltender slid back just in time to make the stop with his left leg with less than six minutes left in the period. The third period ended without anyone breaking the tie; the game went to overtime. It was a tightly contested battle between the two teams but McGill came out as the winner after Chiarlitti squeaked past Concordia defense and defeated Cadorette between the legs. The Stingers won’t have too much time to dwell on their Corey Cup loss as they face Ottawa on Saturday at Ed Meagher arena. Puck drop is at 7:30pm.